As a part of litigation between Oracle & Google in January 2016, Oracle lawyer says Google extracted $31 billion funds/revenue from web service & $22 billion profit from Android. Even its an unanswered question that how does google make money from android? The Google has claimed over Oracle that it has breached the rules relating to Java patents in Android in the year 2010. The case is ongoing. As a result of this, the Oracles adviser/counsel suspected that Google extracts a big income from Android, $31 billion as fund & $ 22 billion as profit from the year 2008. But the main thing to remember that Google has not made such kind of disclosure. It seems that Oracle has counted this on the basis of papers submitted by Google. The reason behind the Oracle's disclosure is, Oracle demands remuneration from Google for its claim over Oracle. The condition has created a difficult situation for Google as it is in two minds. It's hard to accept it openly as it will prove what Oracle is claiming about its income & refusing it may create a kind of fear of money sink in investor's mind since they have invested in Google. And that may be a reason, Google has kept its income hidden. So let's check out how Google generates money as it gives everything for free. Last time we have saw, How Does Free WhatsApp Makes Money 2019 // Social Research and today in continuing to that, we are going to see how Google earn money. When you search something on a search engine, you are able to see some ads around the search results. Every time when somebody clicks on one of those ads, the search engine receives the percentage of money from the pay-per-click basis. Advertisers spend and bids for those placements in the search results for particular keyword phrases of their choice to grab targeted customer. Resulting the higher revenue from ad slots. How does Google generate its revenue? About 85% of Google's US$68 Bn of revenue generated from advertising only. Yeah, that's true! It's advertisements and again advertisements. The maximum share of Google's revenue generates from its most popular two advertising platforms — Google AdSense & Google AdWords. In fact, 95% of Google's revenue is from advertising. How does Gmail make its money? It's Google Mail = Gmail. Once you logged in to Gmail, I am sure you must have noticed lots of ads on the dashboard. Those ads generated from AdWords, AdSense, and PPC. When the user clicks on those ads, the money is then pumped from Gmail, Google Docs and other hosted apps by Google. Around 30% of the total revenue is derived from advertisements in the one FY for Google. The Google can earn up to $50 per click. As per the cost per click (CPC) words list, the 'Insurance' is the high paying keyword in Google AdWords that allows the user to make money for $54 per click. 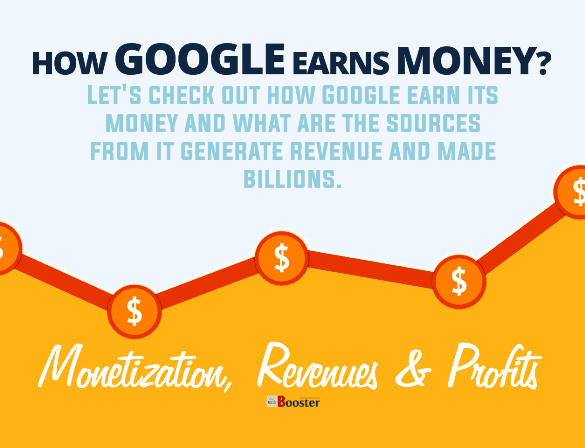 How Google earns money & made billions? When we search something or open a link/website from the Google search engine result page, we came across advertisements on the same page & it's because advertising is a primary source of income for Google. Yes, Google makes money from those ads only by displaying them. Clicking on those ads also ensures some money for Google. The majority of the people use YouTube, Google maps, drive, Gmail, & such other apps & services of Google. In the previous page I was talking about How YouTube Earns Money where you can find out how Google making money by displaying ads on some of those services. But it is comparatively less than computer searches & the reason being the no. of "clicks" are less, but as everyone knows the use of mobile is raising every year allowing Google to draw more money & in a case of Android, mobile advertising is the first choice to make income. Google is a default search engine on iPhones & iPads as the deal is on for $1 billion in 2016 between Google & Apple. That's the saying of Oracle's lawyer, but perhaps that would be a bit more I think. In general, the iOS users are more eligible to buy things online as they are supposed to be rich class. But according to Google till September 2017, there were 1.4 billion Android users across the globe, that means they are large in numbers than iOS users & if we consider a small cut (amount) per Android user then you can imagine how much it will get to Google. That itself proves the Google is yielding more from Android than iPhones. To continue sources of Googles income, mobile advertising is followed by apps. There are more than 1.5 million apps on Android play store & more no. of apps are paid apps or apps that offer in-app purchase. Google receives more than 30% commission on every sale that app developers make on Play Store. But the cut that Google receives from Apple is 70% greater than the cut it receives from Android apps. However, the real thing is that the Android apps installations are two times more in numbers compared with iOS apps installations & this no. is getting bigger and bigger day after day as the no. of installations are increasing. That means 30% of this huge no. makes a lot of money for Google. Google disclosed in its I/O 2015 that it paid $7 billion to developers in 2014 & still it got $10 billion as revenue from Android apps in 2014. So anyone can easily guess it how much Google earns from apps. Along with apps Google also makes some amount from paid music, movies, books, etc. Not everybody does it but there are a million number of users & if you consider it on a small scale then also there will be a huge benefit. 3. Mobile phones, smart devices & hardware. Apart from the above two significant income sources, Google opts to sell some hardware, but the benefit is not that much. Google smartphones and smart devices like Google Glass are also the part of Google income. Everybody knows that in the third quarter of the year 2012, Google proudly said that there are around 500 million Android devices in use with $8 billion mobile revenue run rate which was only $2.5 billion in the third quarter of the year 2011. From that time the figure of Android devices in use is raised 3 times & it is the different part that there is also increase in iOS devices in use; still, the more beneficial thing is it has grown the no. of Android apps this year (2017). After taking into consideration all this, it seems the $31 billion mark is not big. a. This figure is as per Oracles saying. b. Nobody wants to disclose the actual earnings so why does Google? There is nothing called FREE. The Google mostly provides free services, means it doesn't generate money from Android, but the device manufacturers have to pay to ensure their device to run according to Googles compatibility requirements. Google charges everything but in a different manner & yes Google makes money from free apps also. 1. App Developer pays $50 to sign up for getting their app on Google Play Store. Don't consider it as a small value, it's per developer. Therefore it makes a great fund. 2. When anyone gets a phone for the first time everyone Sign-in with Google account. That helps Google to understand users interest on the base of the app that users download from play store. It helps them to put relevant ads which work for them & enables to make extra money. 3. The majority of the ad-supported apps in Google play contains Admob ads (Google ad network). Google puts ads in apps & get its share from the developers for displaying their ads. In short, the Google is very popular a search engine & authority company for publishers and advertisers. And so, it makes sense that the majority of the Google revenue would generate from online web services like searches, advertisements, apps, products, etc., etc. The Google is an important and powerful organization in advertising era, but it is growing the variety of its revenue streams.